Wilson Uwujaren, Abuja: The trial of a former Chairman, Presidential Implementation Committee on Marine Safety and Security, PICOMSS, Air Vice Marshal Saliu Atawodi (retd), Rabin Hassan and his company, Hypertech Nigeria Limited continued on January 17, 2017 before Justice U.P. 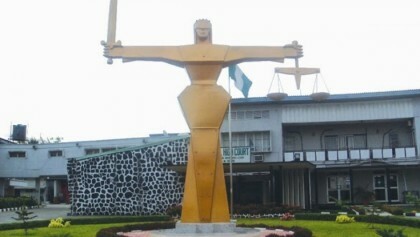 Kekemeke of the Federal Capital Territory High Court, with the cross-examination of the third prosecution witness, Usman Cholli. Atawodi, who was arraigned along with his co-defendants, on May 11, 2016, on a three-count charge bordering on conspiracy, abuse of office and misappropriation of public funds is alleged to have abused his office to defraud the Nigerian Army, and by extension the Federal Government. Justice Kekemeke afterwards adjourned to February 8, 2017, for the continuation of trial.